If you’re like me, you enjoy tackling minor electrical jobs around the house, anything from replacing an old outlet to updating ceiling fans or new light fixtures. After all, it’s fun, right? With a little knowledge and some practice, you’ll find it an enjoyable way to invest in the value of your home at a minimal cost. The worst part, however, is standing at the ready, tools in hand, staring at the variety of multi-colored wires dangling before you. One question lingers: “IS there power pulsating in that little black wire just waiting to throw me from my ladder and slightly adjust my coiffure?” Well, now you can be sure that power is off. 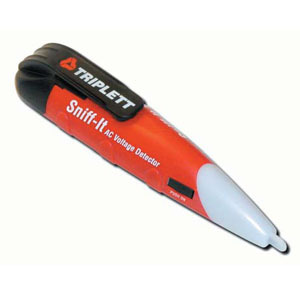 The Greenlee Non-contact Voltage Detector is a tool I’ve had at my side since I worked maintenance in a hotel during my college years (had to do a LOT of wiring with on-the-job training). It is an invaluable addition to any do-it-yourselfer’s toolbelt, and at a cost of just $10-$20, your budget will hardly notice a ripple. 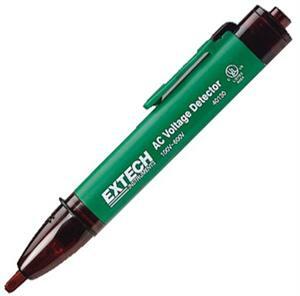 This little ‘magic wand’ (about the size of a pen) can detect voltage in wires, outlets, switches, light fixtures, ceiling fans, air conditioners, and anything else that has AC running through it. 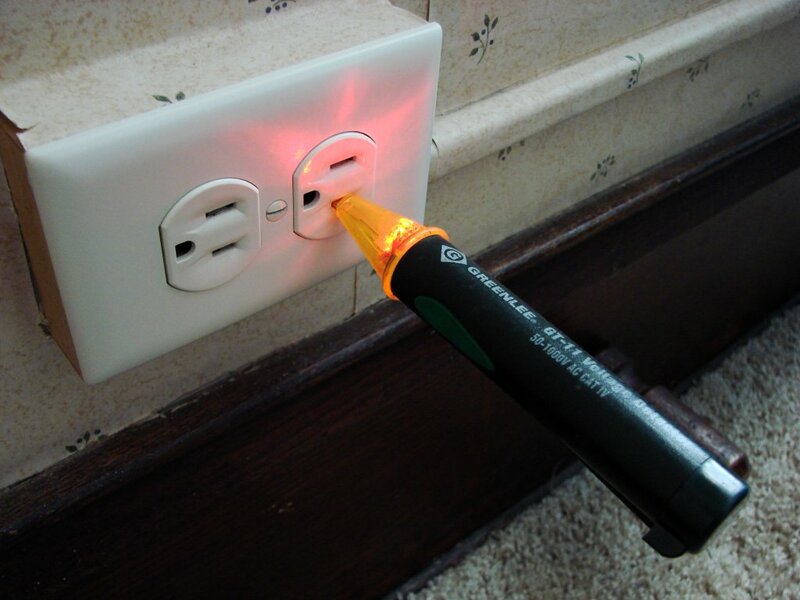 Simply wave the battery-operated tool over the fixture/wire, and an audible tone with visible LED light will indicate that current is present. The sweet part is, you don’t have to expose any bare wires or terminals to achieve this result! BRILLIANT! 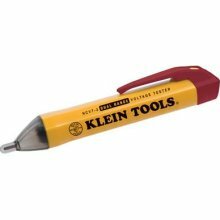 Granted, these devices will not tell you how much current is present, but for most weekend warriors, this “on/off” tool is most adequate. It’s just enough to give you the confidence to grab those wires and finish the job so you can sit down to watch the Buckeyes play while basking in the warm glow and satisfaction of your new light fixture. 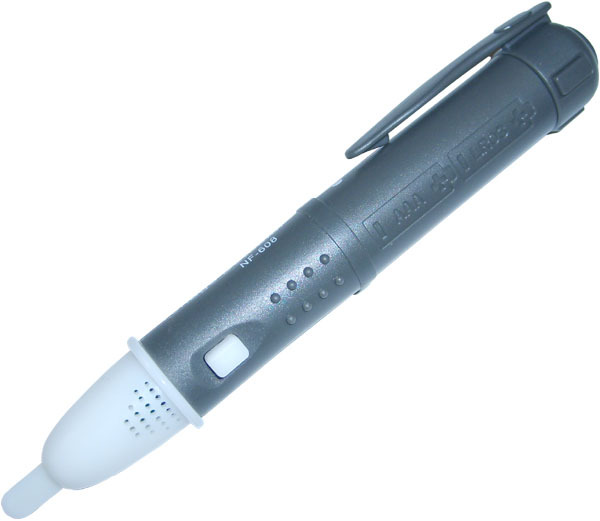 These devices are available in many different shapes, sizes, varieties and makes (some pics below). Check ’em out at any hardware store that sells electrical supplies (MENARDS alone has five different models). No more contact for you; YOU’LL be blowing the kisses from now on!